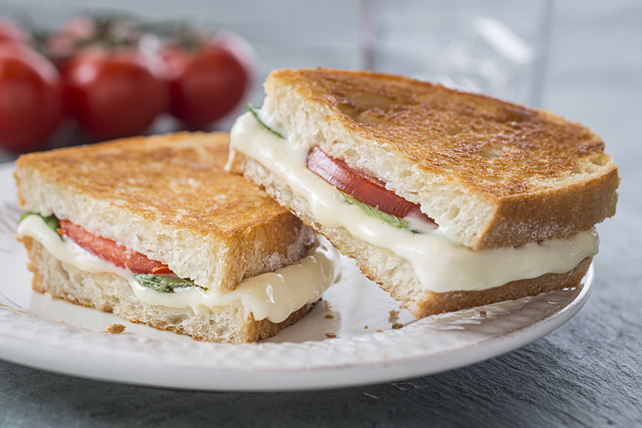 Our Classic Caprese Grilled Cheese recipe is like having a caprese salad stuffed into a hot and crispy grilled cheese sandwich. With fresh tomatoes, basil and plenty of melty mozzarella cheese sandwiched between two crusty toasted Italian bread slices, this yummy sandwich is sure to be irreisistible! Heat small skillet on medium heat. Fill bread slices with Kraft Singles, tomatoes and basil. Cook 2-1/2 to 3 min. on each side or until Singles are melted and sandwich is golden brown on both sides. Serve with marinated pickled vegetables. Prepare using your favourite bread or whatever bread you happen to have on hand. Prepare using Miracle Whip made with Olive Oil Spread*.